I’ve mentioned here before that I like the work of Paul W.S. Anderson, a filmmaker who generally doesn’t get much respect. The movies of his I like most are the “stand-alones”, rather than the franchise productions – Shopping (1994), Event Horizon (1997), Soldier (1998), Death Race (2008), The Three Musketeers (2011) and Pompeii (2014). These are entertainments made with a self-aware visual style, a flair for action, and sufficient attention to character to support the genre conventions. The other strain of his work, the movies which seem to provoke a dismissal of his work altogether, are those rooted in video games; since such adaptations started to appear they have generally disappointed or angered gamers, who see them as a debasement of their source material, and irritated critics who see them as a vacuous affront to the very idea of drama. Both reactions are frequently valid. Game adaptations generally use thinly conceived storylines as an excuse to string together a bunch of action scenes which result in the impression that the audience is simply watching someone else play the game; there’s not much emotional or imaginative engagement with what’s going on up on the screen. And yet Anderson has had his most sustained commercial success with the series of films he has written, produced, and mostly directed based on the Resident Evil game franchise – despite fans of the game being pretty contemptuous of the results. As I’m not a gamer myself, it frankly doesn’t matter much to me whether these movies are a faithful reflection of the game experience; I simply watch them as movies and judge them on that level. 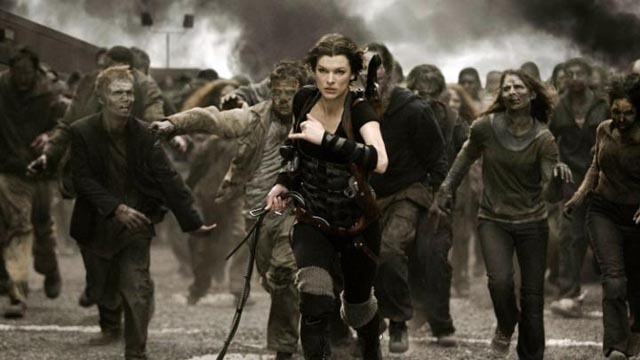 Over the course of six movies, starting with Resident Evil (2002) and now culminating in Resident Evil: The Final Chapter (2016), Anderson has been working out an apocalyptic epic about a world overrun by a zombie plague unleashed from a corporate bio-tech laboratory – a story revolving around the character Alice (Milla Jovovich) who first becomes conscious at the time of the initial outbreak and finds herself in lethal conflict with the Umbrella Corporation as she struggles with questions of her own identity and tries to help other survivors of the plague. Over the course of the series, there’s a feeling that things are being made up as they go along. The effects of the T-virus are not exactly coherent – in addition to transforming most of the world’s population into savage zombies, it somehow produces giant monsters of various types (the new film begins with Alice in the ruins of Washington D.C. facing off against a kind of giant flying reptile). The motives and actions of the Corporation and its executives are vague; their maliciousness and violence seem to exist largely because the plot demands nasty adversaries for Alice and the group of survivors who gather around her. Personally, I think the third film in the series, Resident Evil: Extinction (2007), is the best. Directed by Russell Mulcahy, it comes closest to being a strong story in its own right. Alice reluctantly hooks up with a band of survivors roaming the desert in search of a safe haven; this is the episode when Alice’s true nature starts to be revealed – that she herself is a clone, possibly a bio-weapon, created by the Umbrella Corporation. When Anderson again took on directing chores for the next two films, they reverted somewhat to the string-of-action-set-pieces formula, with the addition of 3D. Now, with the sixth film, Anderson has made an attempt to complete and resolve the narrative arc of the series. Resident Evil: The Final Chapter is the most satisfying episode since number three, even though the script reverts to the gaming formula. Alice is given a time-limited task – to get back to Raccoon City and penetrate the Umbrella Corporation’s underground facility to locate and release an anti-virus which will destroy everyone infected with the T-virus and save the lives of the few thousand remaining human survivors scattered around the world. There are a few logic issues here (if those survivors are scattered around the world, how will releasing the anti-virus in Raccoon City at the exact minute manage to save them all from being overrun? ), but Anderson resolves a lot of story points which have been floating around in the earlier films. We finally find out the truth about Alice’s identity; we learn the truth about how the apocalypse got started and the motives of Alice’s primary opponent, the Corporation’s head guy Dr. Isaacs (Iain Glen). These revelations are woven through the movie’s non-stop stream of large-scale action, with Alice hooking up again with the survivor group lead by Claire (Ali Larter), making a final stand against the zombie hordes in the ruins of Raccoon City. The Final Chapter is essentially a combat film, with the characters forced to improvise against superior enemy forces while resolving their own internal group conflicts. The fact that Anderson is clearly working towards a definite narrative conclusion adds dramatic weight to all this, leading to a satisfying resolution. As for the 3D, as I usually find, it’s largely extraneous – after the first few scenes, I barely noticed it other than as a visual irritant because Anderson shoots a lot of the action with shaky cameras and cuts it all together in rapid fragments; not the ideal technique for 3D as it tends to devolve into a confusing blur. It would probably play better flat. 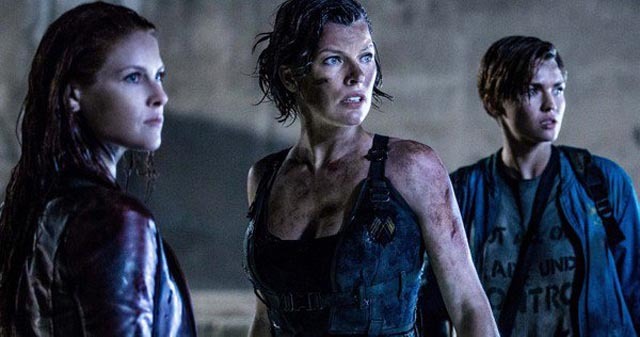 For all the conceptual limitations of the Resident Evil series, this supposedly final episode (Jovovich has said she won’t do another one) is an enjoyable zombie action movie which even manages to generate a bit of emotional involvement by the end. One of the most satisfying recent examples of the genre comes from Korea. Train to Busan (2016) is a fast, tense, and pretty grim glimpse of the zombie apocalypse which adheres to the typical outline: something is causing the dead to reanimate as mindless flesh-eating monsters; the “disease” is transmitted by bite, spreading the zombie plague rapidly; a small number of survivors are thrown together, typically in some confined space (a farmhouse, a shopping mall, an underground lab, on an isolated island, etc.) and intra-group tensions arise, threatening the survival of the few remaining humans … it usually turns out that human beings are as brutal and soulless as the monsters they’re fighting. But luckily the script and direction by Yeon Sang-ho (in his first live-action feature) is anything but routine. After a quick, suggestive prologue which sets up what’s to come (a farmer passes through a checkpoint where he’s told that there’s been a leak at a nearby chemical plant, hits a deer as he reaches for his phone, and drives on, not seeing that the deer comes painfully back to life), Yeon begins to introduce a collection of characters who, even if they are “types”, are fleshed out sufficiently to draw audience sympathy. As the disaster spreads, people we’ve come to care about are killed off one by one, raising the stakes for the rest, some of whom work together while others, driven by fear and panic, betray those around them. Oh, and it all takes place on a speeding train through which the plague is spreading, and it’s not possible to stop and get off because the whole country outside is overrun. Yeon very skillfully weaves the character stuff into the zombie action, generating some genuine emotional heat, and the action is all well-staged. Although I’m usually not a big fan of “fast zombies”, preferring the classic Romero shamblers, they are well-handled here, partly due to some effective variations – they become passive when they can’t see their potential prey, which the characters exploit as the train passes through tunnels – and there are several moments when Yeon slows the action to take time to stay with characters as they struggle with their own fateful transformation after being bitten. There are touches of humour, but mostly Train to Busan moves at a relentless pace towards a pretty bleak conclusion … and what more could you ask of a zombie movie? This entry was posted in Commentary, Review and tagged Asian horror, Directors, Horror, Zombies. Bookmark the permalink.